The only Tote Bag you will ever need! 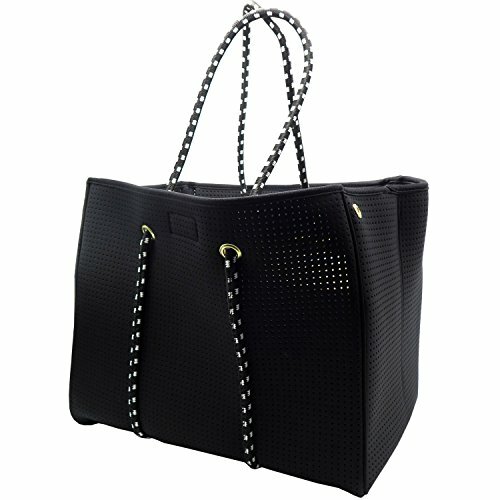 Large Tote Bag made of Premium Quality Mesh Neoprene. Versatile, soft, and flexible - this bag will hold all your daily needs and essentials. Stylish, minimal chic design is perfect from going to the beach or into the office! Sturdy and strong - the thick corded rope straps loop through the entire bag to provide strength and structure to the bag. Easily sits and holds its shape so you can just throw in your essentials and go! Folds down flat for easy storage and travel. Easy secure storage - Inside zippered pocket provides a safe convenient accessible pouch for all your valuables. Small loose matching zippered pouch provides an additional storage option for items you want to keep handy. Easy to clean and machine washable. Machine Wash Cold. Light steam. Do not tumble Dry. Spot clean with damp cloth. Please wash before first use to remove any odors. Perfect for the beach, picnics, outdoors, festivals, parties, office, gym, work, travel, vacation, use as a diaper bag, computer bag, shopping bag, travel carry on - the possibilities are endless! The only Tote Bag you will ever need! Large Tote Bag made of Premium Quality Mesh Neoprene. Versatile, soft, and flexible - this bag will hold all your daily needs and essentials. Stylish, minimal chic design is perfect from going to the beach or into the office! Sturdy and strong - the thick corded rope straps loop through the entire bag to provide strength and structure to the bag. Easily sits and holds its shape so you can just throw in your essentials and go! Folds down flat for easy storage and travel. Easy secure storage - Inside zippered pocket provides a safe convenient accessible pouch for all your valuables. Small loose matching zippered pouch provides an additional storage option for items you want to keep handy. Easy to clean and machine washable. Machine Wash Cold. Light steam. Do not tumble Dry. Spot clean with damp cloth. Please wash before first use to remove any odors. Perfect for the beach, picnics, outdoors, festivals, parties, office, gym, work, travel, vacation, use as a diaper bag, computer bag, shopping bag, travel carry on - the possibilities are endless!